Phillies fans who don't mind a bit of a walk have been taking advantage of the ample free parking at FDR Park for decades. However that has all come to an abrupt halt tonight as the Parks and Recreation Department started to actually enforce its 1984 curfew law. Anyone parked in Franklin Delano Roosevelt Park after 9pm tonight would have found a nice $41 parking ticket after the Phils' win over the Padres. David Toledo, the accused Mayfair tire slasher, has posted bail and is free today. He was released from county jail after his wife posted 10 percent of the $270,000 bail he was being held on stemming from 40 counts of misdemeanor criminal mischief. His attorney downplayed the threats Toledo initially received upon arrest saying things have calmed down. His trial is set for July 12th. 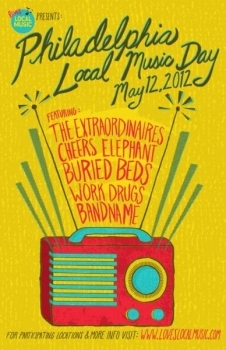 Loves Local Music - Philadelphia Local Music Day is Here! Saturday May 12th! Philadelphia Local Music Day is finally here. Tomorrow all around the city a handful of featured local artists will be heard playing in the establishments of local businesses for the whole day. Since we are also in the business of doing things that "give local musicians more exposure within the Philadelphia community", this sounds like a great idea and hope there's many more to come. Sixers Beat Bulls 4-2 in Round 1... It Comes Down to Free Throws Kids! The 76ers edged past the Chicago Bulls tonight to win 79-78 in Game 6. That clinches this young team's first playoff series win since 2003. They become only the 5th number 8 seed to defeat a number 1 in the NBA playoffs. They'll meet the Boston Celtics in Round 2. The Sixers took full advantage of some keys losses for the Bulls, who lost reigning MVP G Derrick Rose and C Joakim Noah to injury, to get out ahead of the Chicago team in the series. Police in Philadelphia are searching for a man who allegedly threw hot coffee on a Fresh Donuts employee on Tuesday. They say the man and an employee got into an argument about payment at the Fresh Donuts on Lancaster Ave in Powelton Village at 11am. During the argument, the man grabbed a cup of hot coffee from the employee’s hand and threw it on her. He's a black male, 40 years of age, 6'2", 200 lbs, with a mustache. Surveillance video below. The Jury in the 2010 Northern Liberties murder case of Sabina Rose O'Donnell took little time deliberating this morning. After only a few hours they came back with a guilty verdict on the charge of first-degree murder and four other felonies for 20 year old Donte Johnson. Judge Bronson sentenced him to the maximum life sentence plus 40-80 years. The young bald eagle discovered shot, hit by a car, and suffering lead poisoning in a Broomall parking lot three weeks ago is now free. Wildlife officials released it on Monday in Ridley Creek State Park. The eagle which spent it's days recovering at the Schuylkill Center for Environmental Education, took off and flew strong on it's first flight. Only it knows where it'll go next.